After I featured the modest Foursquare that Shirley MacLaine and Warren Beatty grew up in, I heard from a reader who told me about his. Gary Brewer is an architect in New York who saw the potential in this house back when it was “a wreck,” from its rotting porch to wall-to-wall shag carpeting. Take a look at how beautiful his Foursquare looks in the Park Hill neighborhood of Yonkers today! Gary’s a partner with Robert A. M. Stern Architects in Manhattan, and he could have built a new house but chose to restore this circa-1910 Foursquare in the Park Hill neighborhood of Yonkers instead. This is no museum-quality historic renovation, though. I think his biggest accomplishment here was that he turned an outdated “wreck” of a house into a warm and comfortable place to call home. The living room beams were already there, but he added similar ones to the dining room and entry. The original quarter oak floors were refinished throughout. The dining room was given a new picture window, a built-in buffet, and vintage-looking light fixtures. The house has about 2,300 square feet. He considers color a great way to highlight the architectural details in a house. The kitchen, he says, “was a disaster” when he bought the house and required the most work. It hadn’t been updated since the 1970s. He worked with the existing cabinets by leaving the “boxes” and replacing the doors. It definitely has a warm vintage vibe. For more photos and information about his Foursquare, visit Old House Online, This Old House, and Houzz. Photo credits: Francis Dzikowski, Jeff Hirsch, and Tria Giovan. Photo styling: Brice Gaillard. Thanks to Gary for telling us about his beautiful home! I couldn’t stop smiling while I looked through the photos of it. There’s a great interview with him over at New York Social Diary with his thoughts on architecture and why he prefers traditional design over “daring” contemporary buildings with white walls that I enjoyed reading, too! Thank you so much for this! We are just starting the building of our new home and his house has just the feel we are looking for. And that color palette is gorgeous. Now if it will just quit raining. They started grading a week ago Saturday and we’ve had nonstop rain ever since. I, too, am in love with the paint colors he chose, especially that buttery yellow paired with the pale blues + whites. I must find the darker gold on his bedroom’s closet doors. Yummy! That front yard is very ‘busy’, isn’t it? I’d like to get a better look at that. This is timeless and classic, yet manages to be bright and contemporary as well. It’s absolutely beautiful! Love the dining room built-ins. Great job on the kitchen. I love the description of this as architectural comfort food. That’s exactly how I feel about my home; nostalgic without being kitchy. Hi! Being from Yonkers myself, (Both of my grandparents grew up in Park Hill.) That area became very run down. Yonkers as a whole became run down. Everyone retreated to the more Northern Burbs (North of White Plains.) It’s nice to see an architect take on a project and bring glory back to the area. Both of my late grandparents would be thrilled to see this. What a beauty. I really like how he “saved it” more than “restored” it. Everything looks extremely comfortable and the colors certainly make all the difference. Architectural “comfort food” is a great description. I believe there’s not a single thing about this house that I don’t absolutely love, except maybe the thought of carrying groceries up those front steps! Wow! This is an amazing house! I love the way he so skillfully used color throughout his home while at the same time maintains a comfortable flow and transition throughput each of the rooms. Every detail of this home is interesting, stunning yet warm and cozy! I have never pinned so much from one of your posts!! This house is pure poetry. Thank you so much for sharing. Yes, that’s right. House poetry. Exactly. Not one line out of place. Me, too! I asked, but he didn’t have any. Wow, wow, wow! Absolute perfection. I loved it from the first picture. Great restoration, great decoration, love the furnishings… I was bracing myself for the kitchen photos, because usually that’s where they lose me, but that was fab too! LOVE that he didn’t use recessed lighting, and I totally agree with his comment about color bringing out architectural details. My first major in college was architecture. I went another way, but would love to have worked for Robert A.M. Stern. I saw this house on Houzz last year and saved every photo of it. In a world with too much builder beige and blogger “lurve” gray and white (insert eye roll here), this home is filled with happy colors and a lifetime of meaningful objects. I could move into this house today and not change a thing. Love this house – all the details are wonderful. What a great story, and such a beautiful, happy home. The cabinet doors, the built-ins, and a window seat! Sigh. Love the colors and his collections, too. So lovely! It has a very happy vibe. Hello Julia! I always enjoy your posts and houses but this one is fantastic!! I enjoyed all the details and went to read the interview. I love his style. Such a comfortable home. I really like that even though the house wasn’t one specific classification it was still deemed “worthy” of restoration. I was pretty excited when I saw the picture of the porch. What a way to say “hello” and “welcome”! The kitchen may be the most fun kitchen ever! I’ve fallen deeply and madly in love…except the floor. Hi Julia, looking at this home and it’s beauty you can not help but smile. I would love to change all our windows it would be very costly but worth it just to look at the garden through windows like this home has. I am obsessed about changing the windows amongst other things….maybe the kitchen….champagne taste on a beer budget. I’m dreaming again. Thank you for sharing beauty. Till next time regards Esther from Sydney. PS have you got bulbs growing under those beautiful trees we see outside your sun room windows. I’ve just ordered a whole lot of Tulips, Daffodils, Ranunculus and Snowbells. My excuse I’ve been watching too much Martha Stewart. Any home that has a wire fox terrier in it, is perfect! My dream house! Right down to the colors and furnishings. Love the built-ins, love the kitchen and the little table……..just love it all! Oh my! I love this one, and I pinned a bunch of these. Thanks for sharing this one. It’s a beauty!! I love this house. The dining room and kitchen in particular are just gorgeous. I’m with everyone else – this house is perfection! What’s so great about it is it’s humbleness. It isn’t boastful or braggy. It’s just home. I think I could just move right in and not change a single thing. Why oh why aren’t there houses like this in my Iowa town?! i really like this home. it is lovely with a comfortable, livable feel as opposed to being redone to death in hopes of getting a magazine feature. love the color choices! Love this! Comfortable but not pretentious. Thanks for also sharing the interview. I have a friend who’s an interior designer who insists that all architects have a God complex, so reading Gary Brewer’s take on the profession was interesting. Yeah, I really found his perspectives on things refreshing! Loved that interview and his attitude, too. So refreshing in one of the country’s top architectural firms. Why do many modern/contemporary architects want to design houses that alienate the majority of people? Creativity is one thing; slavish devotion to a conceptual ideal of new and ‘modern’ is another. Is it some kind of artistic snobbery? Not that I approve of builders’ designs that have no sense of design context, detail or proportion, either. I’m a bit of a snob about that ;-). A man after my own heart. It’s so nice to know that there’s others out there that respect the historical integrity of old homes. LOVE this one! 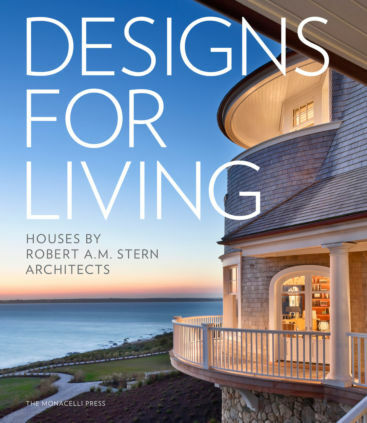 I would expect no less from an architect on Robert A. M. Stern’s team. I love that it retains the details of its period, while being personal, comfortable and not pretentious at all. Surprised this has only a bath and a half. He combined two bedrooms to make a larger master bedroom, but didn’t steal space elsewhere or bump out for a master bath. Kudos to him for keeping the original footprint and not feeling it necessary to add a large master bath. But then, there aren’t any kids sharing the bath! Love, love, love this house. What a great renovation. The perfect combination of warm,classic design and modern conveniences. I could move in tomorrow! It’s the most wonderful house. I like his line that people trade quality and detail for size and architectural mutt!! Love how there is also color on the ceilings. Well, it’s all wonderful and the kitchen is a dream. It’s a beautiful house, but those front steps look like quite a chore. I’m guessing that they would not be too good for an elderly person. Oh wow. This has got to be one of the happiest looking houses I’ve ever seen. The color palette is impeccable. Happy is a good word for it! This is one of the pretties houses I have seen!